Nosejoy is a monthly subscription for home and body fragrances of all sorts. Each month, you’ll get 4-5 scented products, such as candles, lotions, and more. The Products: 4-5 scented home and body items with a fun theme. Nosejoy usually sends this welcome card with a note from the sub’s curator and an info slip that gives a little description of each item in your box. Sometimes there are even subscriber discount codes, and this month’s is for 25% off of your order at Natural Inspirations until 1/31/19. November’s theme is inspired by the spices you might use in your kitchen this time of year. Clever and cozy! This eye pillow has a super-soft fuzzy fabric in a pale orange hue. It emits a faint citrusy scent—I haven’t been able to detect the ginger, but it’s still a nice aroma. I love that you can heat or cool this eye pillow—because of its material, I never would’ve thought to put it in the freezer, but why not? Even just the weight of it is soothing, so if you keep it in your nightstand and don’t want to go downstairs to microwave it, I imagine it’ll still have comforting effects. Now that Thanksgiving is over and I’m looking toward the winter holidays, I’m in a gift-giving mindset and realizing this eye pillow would make a great gift for a traveler, male or female! Nosejoy always does a great job of including unique scented products, and these incense matches are unlike anything I’ve ever seen. They look and strike like regular ol’ matches, but when you blow the flame out, they burn like incense. Obviously, this isn’t something that’s going to burn for hours, but I was a little bummed that it only burned for less than a minute. I lit a few hoping the first one just went out early as a fluke, but the matchstick cardboard is a bit flimsy and ashy tip broke the lit ember off, snuffing it out each time. I guess this product is cooler in theory than in concept, but either way, I can use them as matches to light sticks of incense and get the good smells going quicker than usual—something I don’t mind since it only has a $1.50 value. This is the perfect time of year for a lip scrub to arrive on my doorstep—everything is just starting to get dry as the weather cools down where I live. The scent of this scrub truly is scrumptious and reminds me of what I would put on toast as a kid! I love that such high-quality ingredients are used, especially since it isn’t unheard of for bits of lip scrubs to be consumed here and there, haha. The mixture is a little damp and sticky, so I scooped some out with a spoon, but then I went on to apply it with my fingertip so I could have just used my finger in the first place. My lips felt sooooo soft after. I will probably use this scrub once a day for as long as it lasts! This bath bomb is beautiful with its metallic copper streak! Its scent is spice-ish with a hint of sweetness to it. When I use bath bombs, I typically cut them in half so I can use them twice. But this one is so brilliant-looking that I might have to save it as a stocking stuffer! And, truly, it has a rich pine-ish scent that brings the best of nature indoors. I love love love it. How cool is this tin? I like that the lid pulls off to reveal a pretty pattern so you can display this candle with no label if you wish. Verdict: I loved this month’s theme and felt it was very well-executed! My favorite items were the candle and lip scrub, and I’m excited that I have a few gifts lined up for Christmas already. Most of these products are made in the USA and some have gone an extra step with their eco-friendly, clean, and/or altruistic efforts, which I love. Value-wise, this month’s items exceeded the cost of the box by adding up to 41.95, while the box costs $34.95 with free shipping. I’m happy with that value! Can you still get this box if you sign up today? 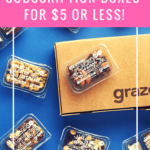 No, your subscription will start with the December box. Sign up by the 15th to get that month’s box. Check out all of our Nosejoy reviews and the Women’s Lifestyle Subscription Box Directory! What do you think of the items in this month’s Nosejoy box? I gifted the candle and bath bomb to a neighbor, but kept the eye pillow, matches, and lip scrub. The eye pillow smells sour if you heat it up, so I use it plain or as a cold pack. The matches I’ve only figured out today! I let it burn until it reaches the stick and then I (holding a mason jar lid underneath it) move the match through the air in an eight pattern. Once the head of the match ashes off, I place the match on the jar lid until it finishes. This is how I get the actual scent of the incense to waft through the air. The lip scrub is my favorite because it smells like cinnamon toast and isn’t to gritty. It is messy, but so is cinnamon toast! So glad you enjoyed this month’s items as much as I did!